[CLEAR PICTURE & WIRELESS]: HDMI signal group output could up to 720 576P, which makes your video more clear. Supports video transmission of PAL/NTSC system and stereo audio transmission. (this is a receiver only). Nikkai 5.8GHz Transmitter & Receiver. Condition is Used. Change channel from another room with the built-in IR remote repeater (note: now compatible with Sky / Virgin remotes). This video sender operates on the 5.8 GHz frequency and others operate on 2.4 GHz. La fréquence 2.4GHz utilisée souvent par les réseaux Bluetooth, WiFi et sans fil est surchargée et donc très sensible aux interférences et à la déformation. • Bande de fréquence: 5.725GHz~5.875GHz. • Bande de fréquence: 5.725 GHz~5.875 GHz. Fréquence de Transmission 5.8 MHz. Couleur Argent/Noir. Sortie de connexions 3x RCA. Nombre de canaux 4. Transmission sans fil = 200m. 1 x récepteur sans fil AV. -Soutenir les 8 groupes de canaux. -Tout matériel conçu sans installer aucun logiciel, plug et play, simple et pratique. Liens utiles. Dispatched with Parcelforce 48. Manufacturer Nikkai. This video sender operates on the 5.8 GHz frequency and others operate on 2.4 GHz. Many household appliances like Wi-Fi, Cordless Phone, Microwave, etc., are also on 2.4 GHz so they will interfere with the standard video sender but with this one, due to its higher frequency you will experience interference-free viewing. We assure you that we will try our best to satiate your needs and resolve issues. We generally solicit your whole hearted support in this endeavour. • The product consists of a transmitter and a receiver. 200M TRANSMISSION DISTANCE Powerful signal transmits video and audio up to≤200m (maximum transmission is under clear line of sight). If Transmit through walls, ceilings, and floors, the transmission distance is 15-20m. Through its own infrared receiver and transmitter lengthener, it can reverse-transmit the standard 38KHz frequency infrared radio frequency. Model: HD585. HDMI interface with the highest resolution supporting 1080@60Hz. SLX 27998R Philex 5.8 GHZ Wireless AV Sender. The transmission range is up to 30m depending on conditions. Made from plastic. (not included). Not affected by wireless computer networks or cordless phones. Features: 5.8 GHz ISM frequency band. 300m transmission range without any holdback. Patented Wireless technology. avoiding the interference from other wireless device. Support PAL/ NTSC system and stereo audio transmission. (9) Transmitter accessories：transmitter,antenna, Connection Cable ( Black and red is the power of positive and negative, the yellow video cable, white audio cable). 6) Working Channels：9CH. 5) Working Frequency：5.8G. MARMITEK GigaView 545 - 5.8 GHz Wireless Audio/Video Transmitter - keine Empfanger! • Montieren Sie den Empfänger (unsichtbar) hinter Ihrem TV oder an die Decke bei Ihrem Projektor. extra Transmitter zur Erweiterung des GigaView 545Set. Featuring 5.8GHz transmission technology, it is the alternative solution to air wave congestion caused by high power Bluetooth and wireless LAN products. External, omni-directional antennas provide twice the performance and reliability of conventional flat panel antennas. 1st box is Video Sender A00HR containing two units. 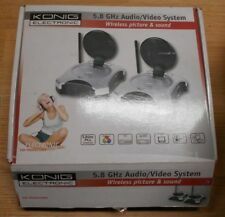 Not sure if the set is complete.The 2nd box contains Video Receiver A17HU. Not sure if complete. What you see in the photos is what you get. 1x Wireless sender. Not affected by wireless computer networks or cordless phones. COP 15-5800VR 8 Canaux 5.8GHz Transmetteur. (7) Working Power：200mW. 7) Receiver Accessories：Receiver,antenna,Connection Cable. 6) Working Channels：9CH. 5) Working Frequency：5.8G. 4) Working Current：200mA. 1) Weight：35g. Nikkai A31JL 5.8GHz transmitter - sender only. no receiver, cables or manual - just in case you need a spare! 5.8GHz kabelloses Audio Video Übertragungssystem. CGV FREEline SP Wireless Video Sender (5,8 GHz). Produkttyp : Wireless -Video-Sender - Forward Fernbedienung. Sendeleistung: < 20mW. Antenne: Omnidirectional integrierten. Transmission Audio / Video Frequenz: 5,8 GHz. How does the GigaView 545™ work?. It's really simple! The set consists of a transmitter and a receiver. Then connect the receiver to your second TV. Wireless transmission of pictures and stereo sound through walls and ceilings.